Having a girly three year old at home, we have a lot of fun painting our nails. My daughter gets so excited when I agree to let her paint my nails. She is surprisingly good but most days I spend a few minutes with polish remover before I leave the house. This week she begged me to paint my nails with glitter polish. 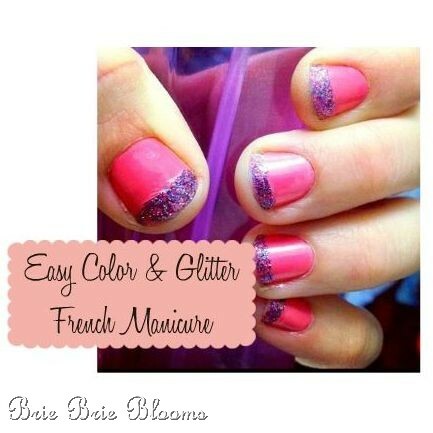 Don’t get me wrong, I love glitter, but I wasn’t up for a full glitter manicure. We compromised and I ended up with a colorful glittery french manicure. My daughter’s favorite part of painting our nails is picking the polish. We decided [my daughter convinced me] my nails should be bright pink and purple. For this manicure I used e.l.f. 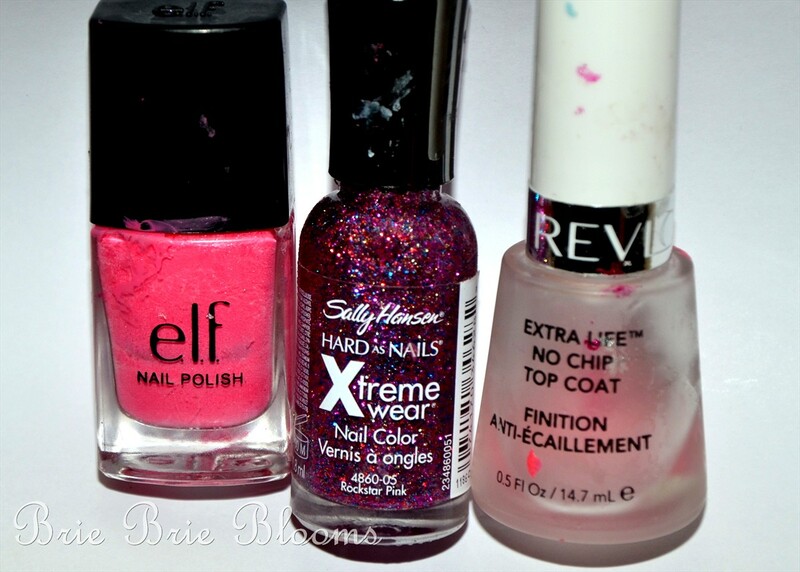 “Fluorescent”, Sally Hanson Hard as Nails Xtreme Wear “Rockstar Pink”, and Revlon Extra Life No Chip Top Coat. Excuse the poor condition of the polish bottles. My daughter is a messy artist. Start with two coats of pink. 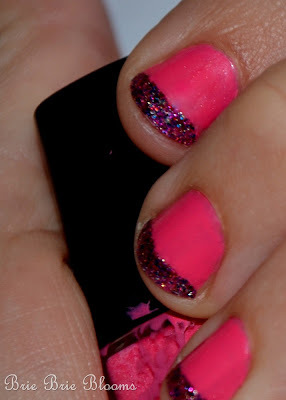 Let nails dry completely and then carefully add a thin line of glitter polish to the tip of your nails. The Sally Hansen polish was thick and made it very easy to draw a straight line by hand. When polish is dry, apply a second layer for more sparkle. Finish your nails with a top coat. My daughter said they look fantastic. I agree. You can’t go wrong with hot pink and purple glitter! its me again, over from Tip Junkie. I think our daughters would get along really well! We love doing the same things together. After I show her this, I know how our nails will look tomorrow! Love this! Such a cute way to brighten up your nails! Thanks for sharing with the Pink Hippo Party! My little girls would love that! Thanks for sharing this week at One Creative Weekend! I’d love for you to join the party again tomorrow.